Preventive Power and Maintenance, Inc.
Preventive Power and Maintenance is an International Company, with a dedication to "Satisfaction and Safety" . PPM has performed energized coatings and insulator cleaning safely for utilities and industrial facilities for numerous years. All application engineers are professionally trained by our staff to perform our services while substations are energized, and are certified in lead abatement procedures. We use different types of specialized coatings. These coatings are catered to your environmental conditions. Our insulator cleaning consists of grit cob and pulverized limestone. This material is dried before being sprayed through an insulated fiberglass wand. 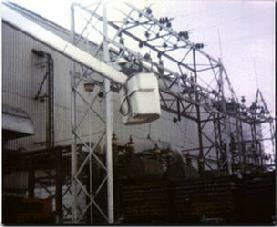 Our ptotective coatings services are applied while the substation is energized. (Safety is our main goal). Preventive Power and Maintenance, Inc. offers a full line of engineering services. We perform coordination studies and one line diagrams, power factor correction and infrared scanning. The testing, calibration and retrofitting of low and medium voltage circuit breakers. © 1997 - 2010 Preventive Power and Maintenance, Inc.